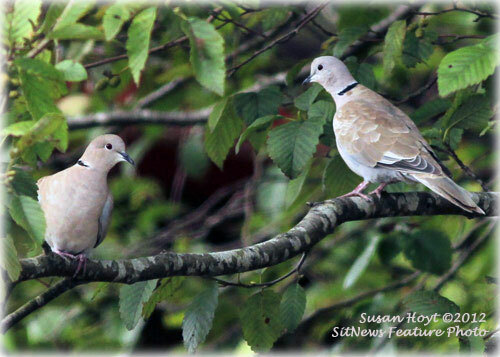 (Correction) According to avid Ketchikan bird watcher Jim Lewis, these doves did migrate here and there are several groups throughout the Ketchikan area. A nest was found last year on the North end. The Eurasian Collared- Dove is an invasive species that is all over the U.S and is spreading through Alaska quickly. These birds were originally released in Bermuda in the 70’s. Ketchikan: Wood Energy Conference to meet in Ketchikan (SitNews) - The 2012 Alaska Wood Energy Conference is scheduled for Oct. 9–10 and will be held at the Ted Ferry Civic Center in downtown Ketchikan. The conference will focus on community use of wood biomass. Many communities in Alaska are turning to locally available woody biomass resources to reduce their energy costs and create economic opportunities for their residents. The 2012 Alaska Wood Energy Conference sessions will feature community leaders and decision-makers who will discuss their communities’ experiences after making the decision to include woody biomass as part of their energy services. Other sessions will include insights on converting to, operating and maintaining a woody biomass system; source and sustainability of forest resources; potential impacts of woody biomass utilization; and the latest technology and equipment. Anticipated registration for the 2012 Alaska Wood Energy Conference is 200 individuals from across Alaska and neighboring countries to share information and provide training on important issues about biomass utilization in Alaska. Alaska: Cruise Ship Science Advisory Panel To Meet - The Alaska Department of Environmental Conservation (DEC) will host its sixth Science Advisory Panel meeting of the year along with a technology workshop from September 19-21 in Juneau. Guided by state law, the Alaska Department of Environmental Conservation established the 11-member Science Advisory Panel in 2009 to evaluate the most “technologically effective and economically feasible” methods for pollution prevention, control and treatment of cruise ship of wastewater. Its members include representatives from the Coast Guard, the U.S. Environmental Protection Agency, land-based and marine wastewater treatment experts, the fishing industry, the cruise ship industry, academia and a marine conservation organization. The Panel will advise DEC as it prepares to report the Panel’s findings to the state legislature. The group’s first meeting took place in February 2010. Alaska: SEARHC encourages prevention against pertussis - The SouthEast Alaska Regional Health Consortium (SEARHC) is joining with the Alaska Department of Health and Social Services to recommend that all Alaskans make sure they have a current pertussis (whooping cough) vaccination. In July, the Centers for Disease Control and Prevention (CDC) said this summer’s whooping cough outbreak could become the worst in the United States in more than half a century. Already this year the states of Washington, Wisconsin and Minnesota each have reported thousands of cases, and Washington declared a state health emergency in May with emergency funds being used to buy vaccines. As of Aug. 27, Alaska had reported 113 cases compared to just 24 last year, with the vast majority of cases located in the Anchorage/Mat-Su Valleys/Interior regions. However, there recently has been a confirmed case in Haines and more are expected in Southeast Alaska. Alaska: Primary Election Ballot Measure Results Certified – Lieutenant Governor Mead Treadwell announced today the certification of the 2012 Primary Election ballot measure results. DANNY TYREE: Are You Ready For Immortality? - According to ABC News, "Business Insider" and other sources, phrases such as "Nobody lives forever" and "death and taxes" could become quaint relics in just a few decades. Russian billionaire Dmitry Itskov and 30 top Russian scientists have formed a collective called The 2045 Initiative, with the goal of designing a future in which humans will be routinely upgraded to androids/hologram avatars. Shortly before death, a person's personality/thought patterns/consciousness would be uploaded into a super-powered artificial body. In other words, over the next 33 years, the human race would achieve IMMORTALITY! Itskov has sent an open letter to the 1,266 individuals on the Forbes World Billionaires list, challenging them to fund the project (for profit AND for the betterment of the species). PHIL KERPEN: Che and the EPA - On September 13, the U.S. Environmental Protection Agency (EPA) sent an internal email to its staff under the subject line "Hispanic Heritage Month." The email, obtained by The Weekly Standard magazine, featured a picture of infamous communist butcher Che Guevara with the slogan "hasta la victoria siempre," or "on to victory, always." Che has long been a hero of communists and other radicals for his brutal tactics, and the iconic photo of Che taken Alberto Korda has shown up in inappropriate places before. But it is especially chilling to see Che's image being used by a government agency that has pursued an astonishingly aggressive anti-growth and anti-property rights agenda. The seeming ubiquity of Che's image should not desensitize us to the depravity of the man. Alvaro Vargas Llosa explained the depths of Che's evil a few years ago in the New Republic. He noted that Che wrote in "Message to the Tricontinental" in April 1967: "hatred as an element of struggle; unbending hatred for the enemy, which pushes a human being beyond his natural limitations, making him into an effective, violent, selective, and cold-blooded killing machine." For More Political Cartoons, Click here or on the graphic.